Ghana has emerged as one of the most robust and developed startup ecosystems on the continent, following Egypt, Kenya, Nigeria and South Africa – as the major hubs on the continent. Ghana’s growth is thanks to several strengths, including significant consumer and business markets, sophisticated entrepreneurial talent, and a strong corporate sector. Ghana has access to local capital and ties to a growing number of international investors. High tech startups thrive in the midst of a growing number of startup support organizations active in the ecosystem. For the fifth consecutive year VC4A has produced annual research and analysis on trends in the African startup ecosystem. For the 2018 research cycle, VC4A has published a pan-African study including 6 country specific deep dives. 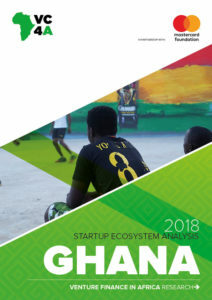 VC4A research on 522 ventures registered in the country shows a clear relationship between venture performance and the support these ventures receive from the Ghanaian startup ecosystem. For example, 50% of companies participating in ecosystem support programs secure investment. Even more interesting, the average investment secured is more than 2.5 times higher for the ventures receiving ecosystem support: USD $322K vs USD $124K. These companies are also more likely to create new jobs. More specifically, 71% of the Ghanaian ventures are creating jobs with an average of 8.04 FTE per venture. When taking a further look at the age groups, 60% of the employees are between 12 and 35 years which is equal to the percentage that has been tracked by VC4A on a pan-African scale. This is a considerable contribution to the country given its growing population and justifies further investment in the growth and development of the startup ecosystem and the entrepreneurs it supports. Re-defining Africa’s Business Environment & Educational System Through Modern Technology. The course on ‘Grow your business’ is for startup founders who are looking to scale their operations when they are getting traction for their product or service. The ‘Your legal business’ course is aimed at founders who want to learn more about the legal implications of setting up their business and getting their operations funded. The first module focuses on legal basics, the second module on the funding concepts.